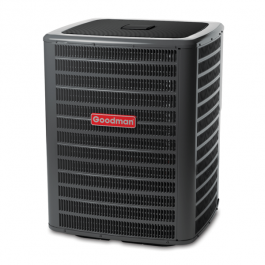 The Goodman DSXC16 Air Conditioner uses the chlorine-free refrigerant R-410A and is part of our new ComfortNet family of communicating units. In addition, the DSXC16 features energy efficiencies and operating sound levels that are among the best in the heating and cooling industry. This unit contains the two-stage, high-efficiency Copeland scroll compressor, which provides improved temperature and humidity control for the consumer who desires superb comfort and quiet operation.